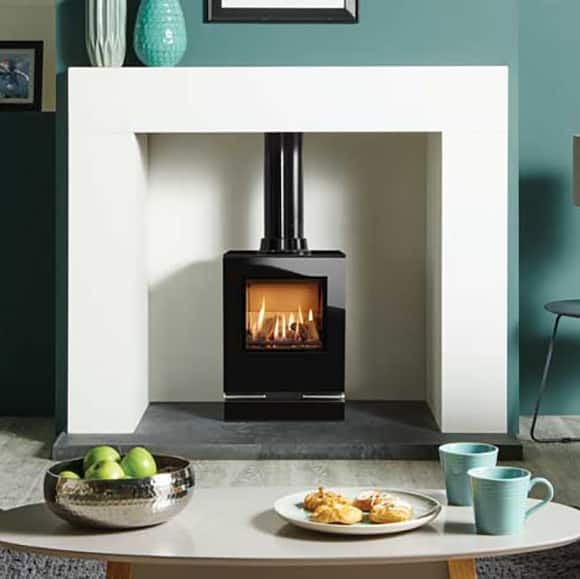 The Gazco and Stovax group constantly develops its product ranges such that the businesses have grown to become one of Europe’s leading manufacturers of stoves, fireplaces and fires, with exports to countries worldwide. 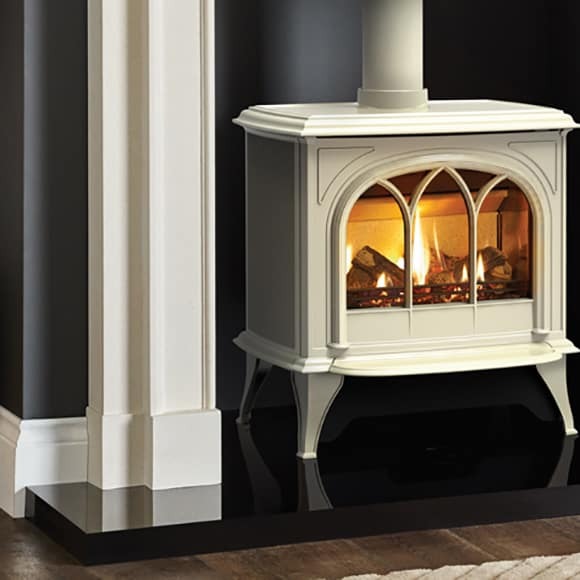 The compact Gazco Huntingdon 20 gas stove’s proportions make it perfect for most British fireplace openings. 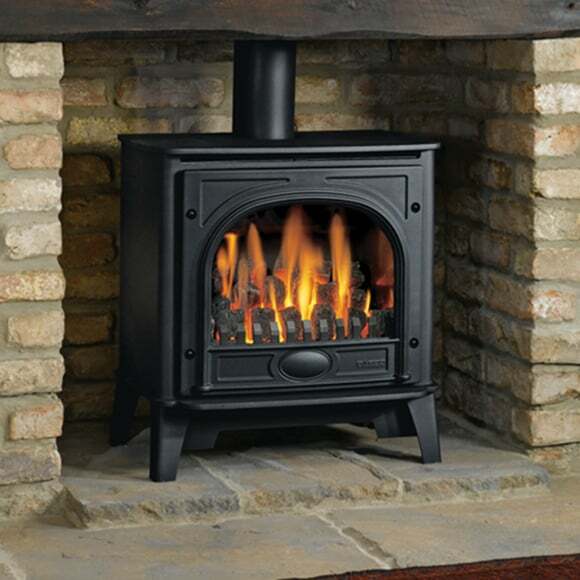 The Huntingdon 30 is one of the popular range of gas stoves. 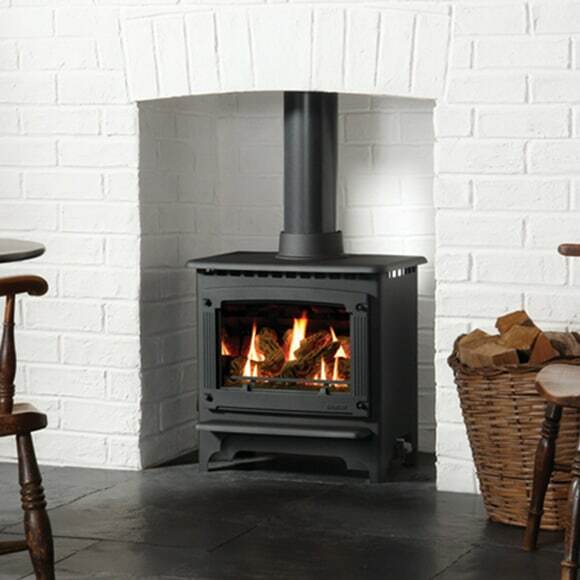 A traditional looking stove with curved windows and a ambient feel when watching the flames. Available with log or coal effect and three different colours, Ivory enamel, Matt Black and Matt Ivory. 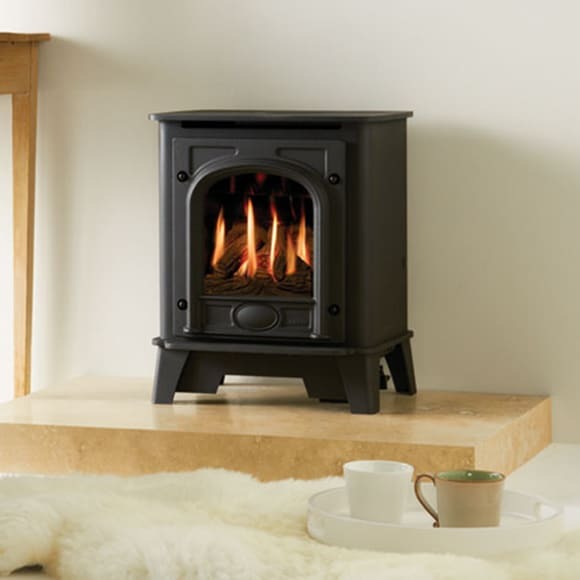 The Huntingdon 40 is the largest of the Huntingdon range which is a 5.4kW heat output. Perfect for big fireplaces and spacious interiors. Can be chosen with tracery, refined style or clear door for an uninterrupted view of the rolling flames. The Marlborough Small would suit traditional or contemporary, whether it is city or country. 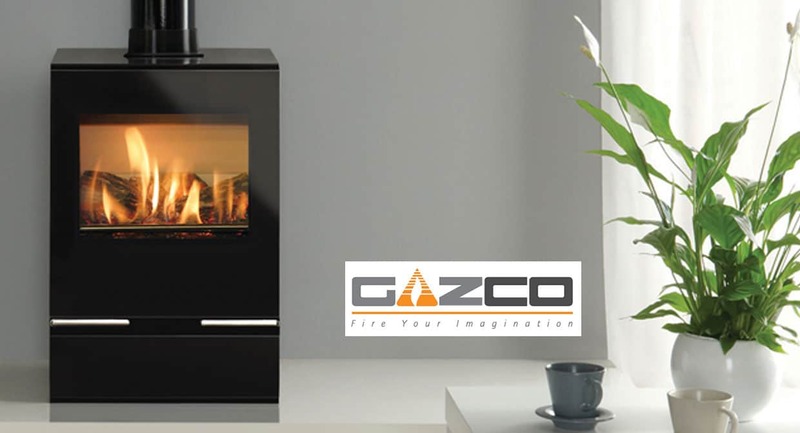 Gazco Marlborough gas stove gives you the flexibility. 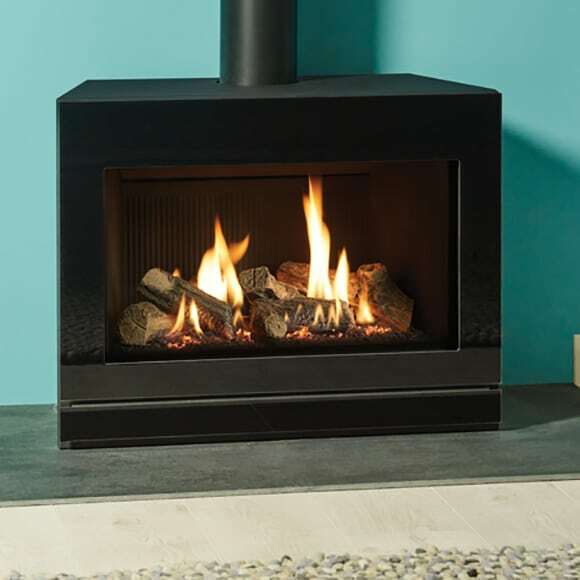 Choose from coal or log effect gas fires. 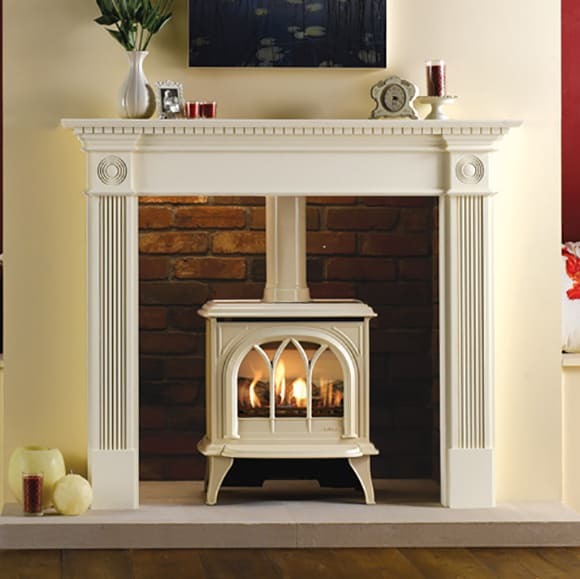 The Marlborough Medium gas stove would suit any home whether it was traditional or contemporary. It has a controllable output with manual control, there are two upgrades for this control, Gazco’ command remote control or the deluxe programmable remote control. This is the largest Marlborough model out of the range. 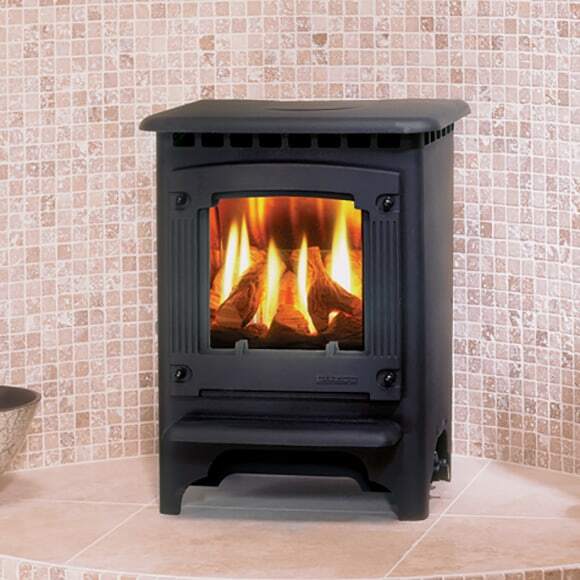 This stove is suitable for any type of home whether it is in the city or in the country. Even if the home is traditional or modern it will fit in beautifully. This stove comes in coal or log effect fires and both comes in Matt Black. 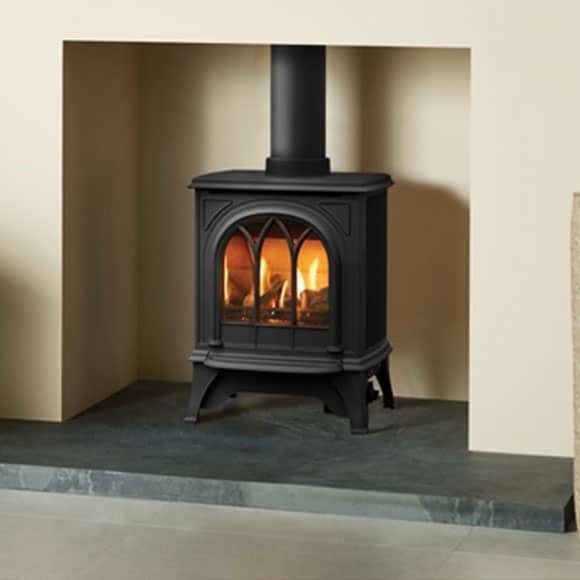 The Stockton Small stove is great when space is a bit limited. It is perfect for a traditional home. 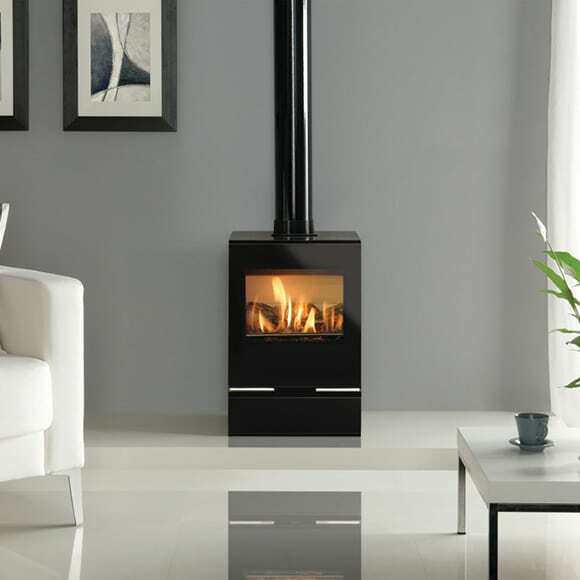 This stove comes in Matt Black and has the option of being coal or log- effect fire. 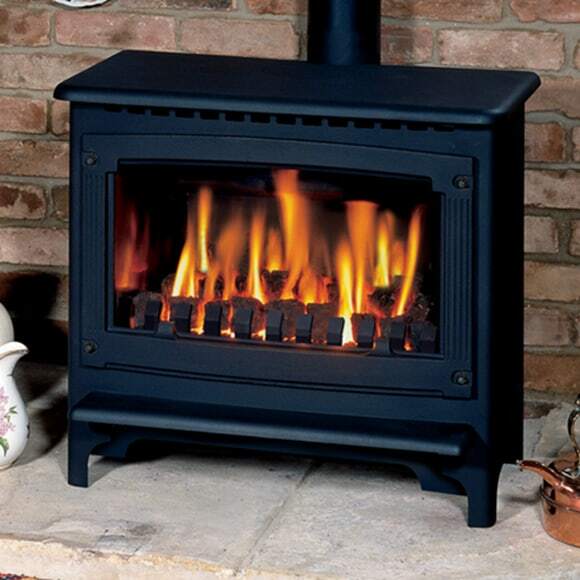 Stockton Medium gas stove is great for someone who wants a real fire effect but the convenience of gas. It comes in Matt Black and either a coal or log- effect configuration. There are remote control upgrade options e.g. from manual to Gazco command remote. Stockton 5 gas stove sits in the middle of the Stockton range. Its bigger than small but smaller than a medium. It still has it’s traditional charm and will fit perfectly in a country or city home. It is Matt Black and can be chosen in a coal or log- effect fire. 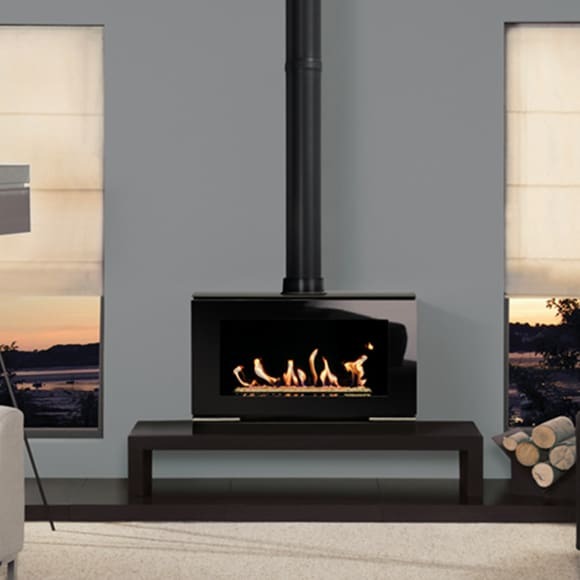 The Riva2 F670 gas stove will suit any interior with it’s big large glass window to view the flames. It has a mirroring effect to give the stove more depth and more realistic flames. This steel gas stove is perfect for modern room decors, it comes in two sizes meaning it would fit in any size room. The Manhattan also comes in two different finishes which means you will find the style that fits your room style. It is complemented with a black cast iron top grille which convects the heat into the room. The Studio 1 is a freestanding gas stove with many different fuel beds ranging from log effect to pebbles. It also comes with a programable thermostatic remote. The Studio 1 comes in black or white and would fit in any modern decors. The Studio 2 is a freestanding gas stove with many different fuel beds ranging from log effect to pebbles. This stove has so many different options it would fit in any type of interior. Easy to use remote and this stove is available in either balanced or conventional flue versions. The Vision Small gas stove suits any modern interior when space is limited. It comes with a Black Glass finish and is fully remote controllable for ease. 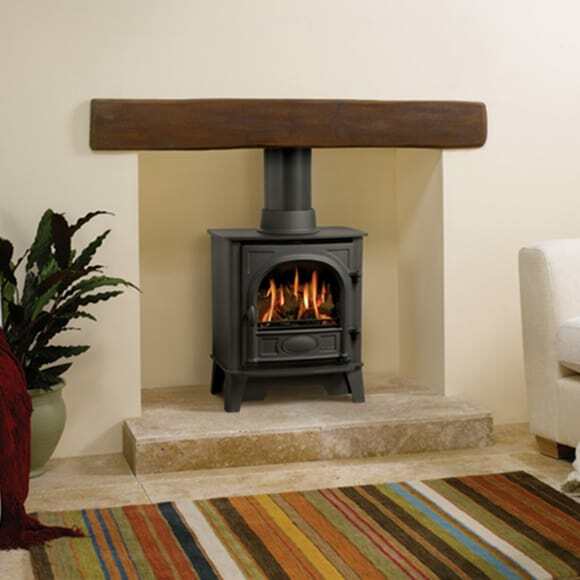 This stove has both conventional and balance flue options. It also works with LPG as well as natural gas. 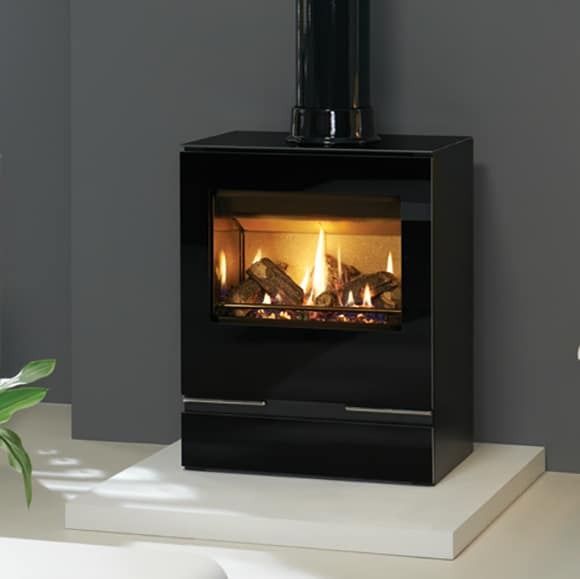 The Vision Midi slightly bigger than the Vision Small, it has lovely clean lines and is in a stylish black glass finish. This gas stove would look lovely in any modern interior. It comes with manual control but it also has options for a standard or programmable thermostatic for easy and convenient control. The Vision Medium is one of the larger models in the range. It would suit larger rooms with matching heat output. It has lovely clean lines and possesses a black glass finish. The firebox has mirrored stainless steel sides where you can view the rolling flames at any angle. The Vision Medium is available with natural or LPG gas. 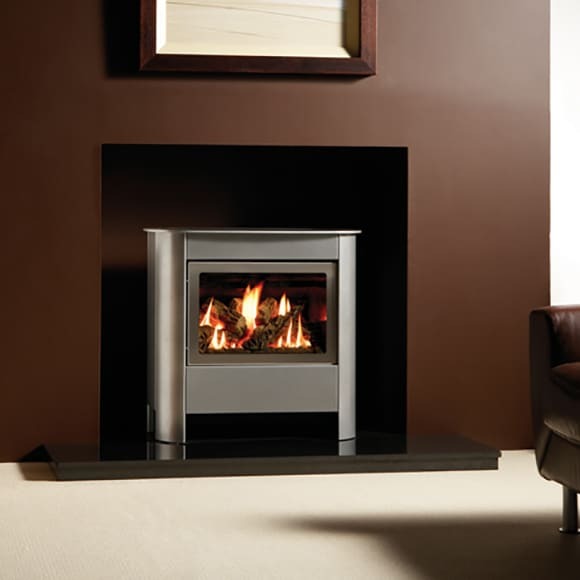 The Vision Large gas stove is the largest of the Vision range. It would suit homes with large rooms and would fit perfectly in a chimney or free standing. 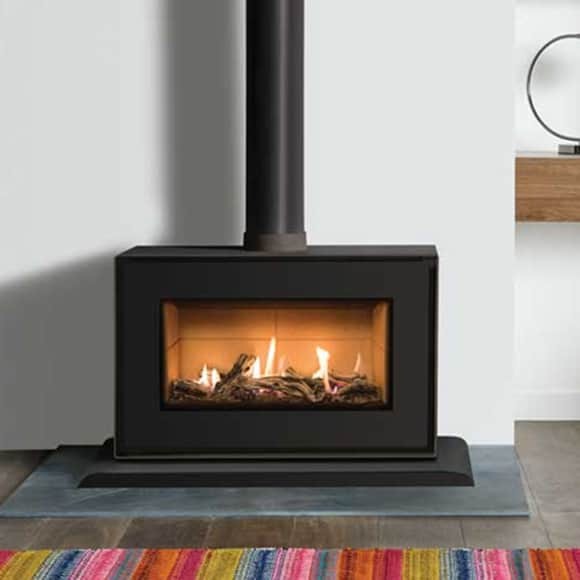 This stove comes with multiple fuel beds, whether it is log effect or pebble effect, there are options to suit any interior. 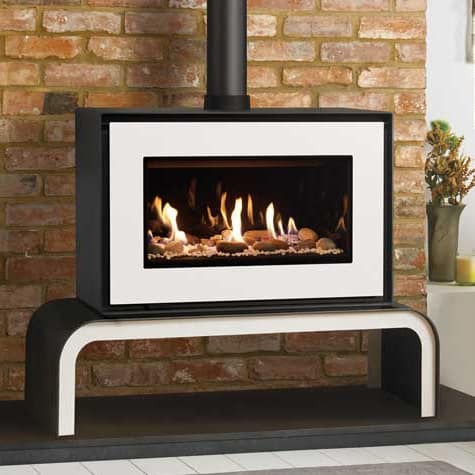 This stove has a large viewing frame, giving a ambience effect of the rolling flames.